Color is one of those things that we take for granted. We inherently assume that the colors we see are the same as everyone else. This is not always the case, however. For some people, their experience with color can be dramatically different than the average individual. These are people who have what is known as “color blindness.” The term is technically a misnomer since most people with color blindness still have color vision—theirs is just different. Understanding color blindness and its causes requires a bit of background information on how the eye works, and understanding that requires a brief exposition into how color works. Let’s begin, shall we? Light comes in varying wavelengths, each of which results in a different color. The traditional Roy G. Biv of the rainbow is what happens when light gets refracted across its different wavelengths. As the acronym implies, red is at the upper (longer) end of the wavelengths, green is in the middle, and blue is nearer the lower (shorter) end. When light hits an object, some of these wavelengths are absorbed and others are bounced back. The ones that bounce back are what our eyes receive. The retina is the thin layer of tissue at the back of the eye. 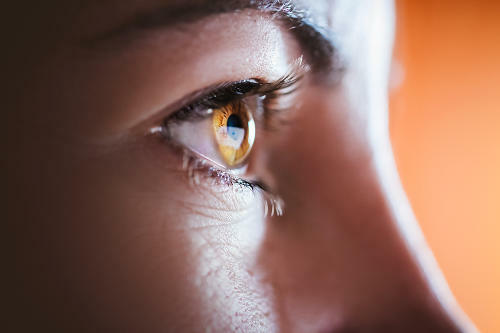 Your retinas are filled with millions of light-sensitive cells known as photoreceptors. These photoreceptors come in two main shapes: rods (about 120 million per eye) and cones (about 6 million per eye). Rods and cones set off different electrical signals in response to wavelengths of light, which are sent to your brain and interpreted as color. Most discussions of color blindness revolve around the cones because they come in three different types (rods only have one type). These types are sensitive to different photopigments (molecules that react to certain wavelengths of light) and come in red, green, and blue varieties. The combination of these activating is why we see in color. Depending on which photopigments are affected, different types of color blindness are possible. These types fall into different categories. In order of most common to least, these categories are: red-green color blindness, blue-yellow color blindness, and total color blindness. Rarer than red-green, this type of color blindness tends to affect men and women at an equal rate. Tritanomaly: Limited blue cone function. Blues appear green and yellow, red, and pink are hard to tell apart. Tritanopia: Blue cones are missing. Blues appear as green and yellow can look violet or even light gray. There are two types of complete color blindness, both of which represent a total failure of multiple cones. Rod monochromacy: The rarest type of color blindness is when none of the cone cells work. People with this condition can only rely on their rod cells, which are only able to see things in black, whites, and grays. Since rods primarily respond to dim light, people with this condition can be uncomfortable in bright environments. Color blindness is overwhelmingly an inherited disorder. Red-green color blindness is an X-linked condition, which is why there is such a large gender imbalance. Women have two X chromosomes, so the genes from one can compensate for failings in the other. They would have to get the red-green gene from both parents to be affected (men can get it from just the mother). Blue-yellow and total colorblindness are what is known as “autosomal recessive,” which means it takes a copy of the defective gene from both parents in order to cause the disorder. This is why there is no major gender difference. Although color blindness is almost always inherited, there are certain conditions that can cause the disorder. This is because the brain and cones need to cooperate in order to perceive color, so ailments that can impair either can lead to color blindness. Are There Treatments for Color Blindness?